On a cold February morning in 2017, we broke ground for construction at Mullet Hall. The contractor is Third Floor Corp/Doctor Structure. 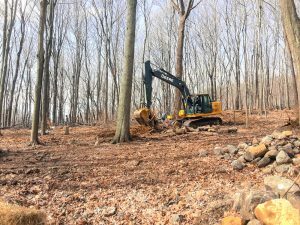 Having grown so accustomed to being in the forest on the land, it was hard for us to see the trees begin to come down to make room for the house. We sent as much of the wood as we could to Dain’s Lumber and to Meltz for milling. 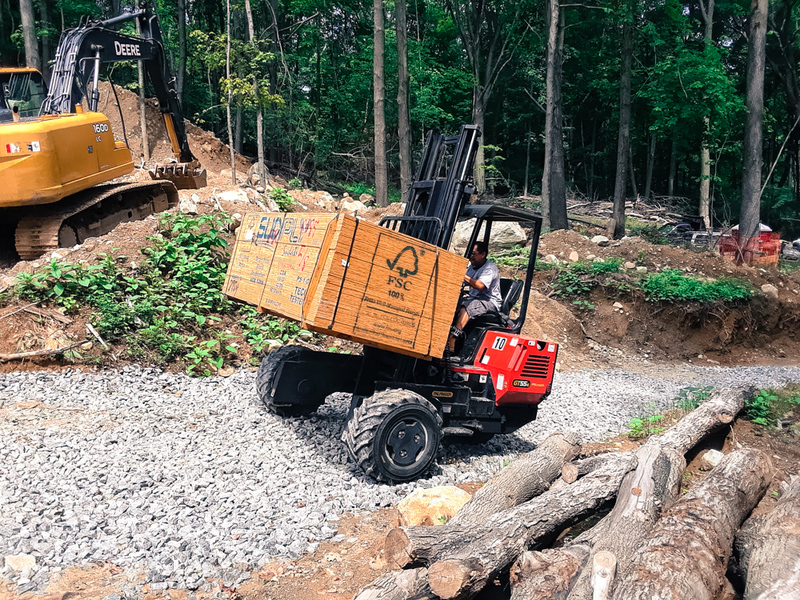 Most of the Sugar Maple is being milled for flooring, and the larger Red Oak and Black Cherry is being milled for shelving, trim, and other uses. The one large Tulip tree was straight and true, and is being milled for door and window surrounds. Smaller diameter trees have been chipped for mulch or will be used for firewood in the wood stove. 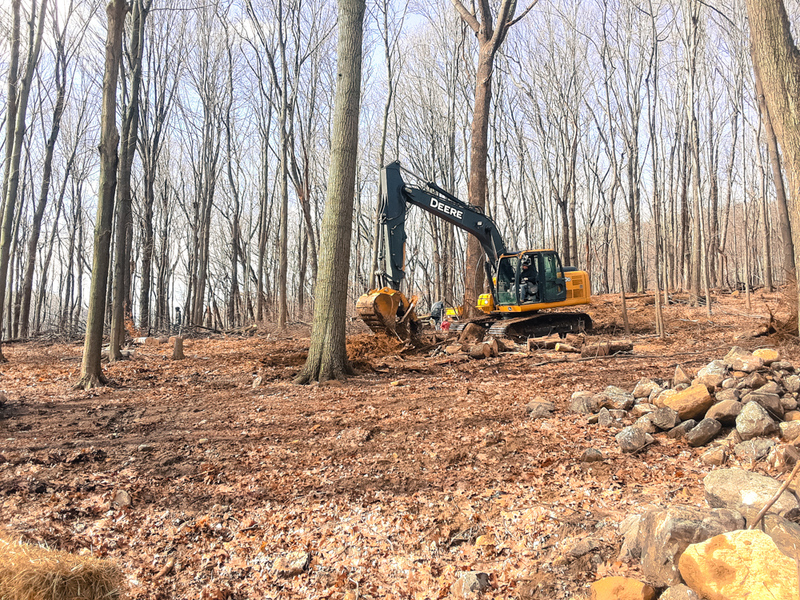 The advantage of cutting trees in Winter is that the frozen ground is not as severely impacted by compaction with the machines running over it. As it turns out, we had a series of severe storms when Spring and Summer came, which took down even more trees. We at The Figure Ground Studio often extol the advantages of working closely with an Architect and Landscape Architect from the outset of a project to ensure that a structure is advantageously situated on the landscape. All too often, a landscape architect is brought into the process much too late – and floor levels and entry locations/elevations have been set without considering the overall landscape design. We performed an exhaustive series of sectional studies to make sure that we could achieve ground level access to the house from the drive/carpark/yard, and then easy access from the rear apartment entrance and house second level exit to the rear portion of the lot. This entailed working closely with existing grades provided by our Land Surveyor as well as looking at proposed grades designed by TFG Studio Landscape Architect, Erin Muir. After Perry Masonry excavated the house and garage, the overall situation of the house and garage became clear on the landscape. We were lucky not to hit any ledge – and we found a few new boulders to be incorporated into future boulder walls and retaining areas. 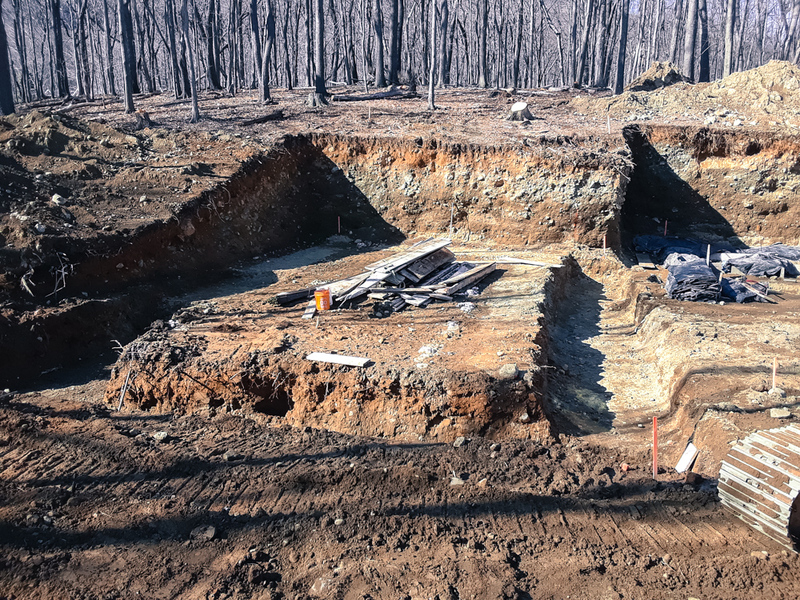 The advantage of working with an independent land surveyor (in our case, Rowan Land Surveying) was that after creating the boundary survey and one-foot contours for a base, we were able to call him out at a moment’s notice to locate foundation corners and elevations. 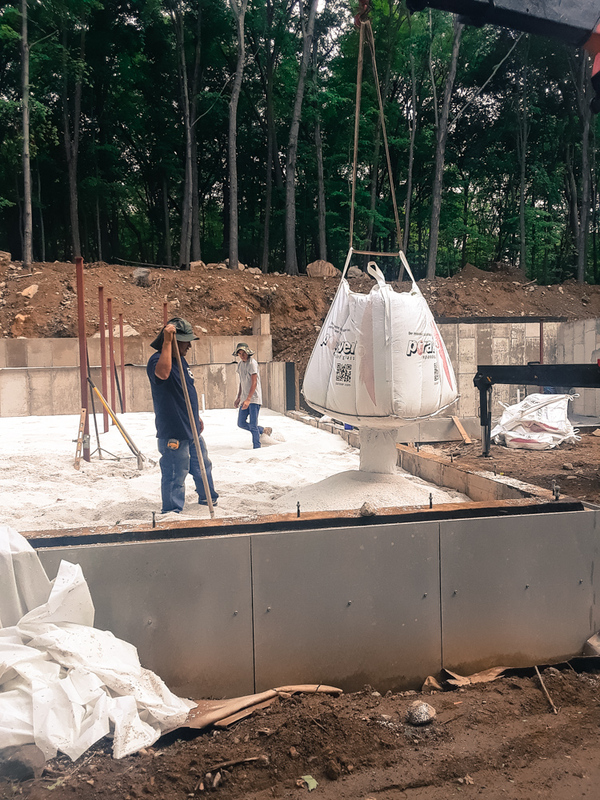 Once located precisely, the frost footings were poured by Perry Masonry, Inc.
As we have previously discussed, one of the great challenges of this project is finding Red List free materials in accordance with the Materials Petal of the Living Building Challenge. 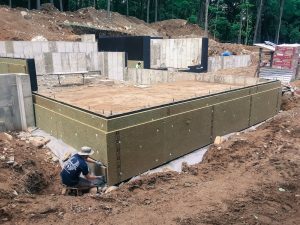 For footing damp-proofing and and foundation/footing capillary break, we chose to use Henry CM-100 because Henry was able to provide us with a letter certifying that this product was free of Red List materials. As there is growing understanding of the dangers of material toxicity for building inhabitants, the Living Building Challenge guideline of eliminating toxic materials from the project broadens the scope of our responsibility to ensure that the manufacture of items used in the construction of this home do not create undue impact at their point of manufacture, and that materials which are used during construction – even if they do not ultimately have an impact on indoor air quality – ensure a working environment and job site which is healthier for contractors and subcontractors. After the footings were poured, our first great materials challenge looked before us – no one on the project team had worked with Poraver before. Despite this, were determined to use it because of the following benefits: increased recycled content in the concrete and increased thermal insulation value in the resultant walls. The first day at Putnam Mobile Mix was exciting – as we determined that a slight modification had to be made to the formulation to allow the use of the mobile mixing truck. It was amazing to me how challenging the first day working with the Poraver was (perfecting the mix, figuring out the order of operations, etc.) as contrasted with the second day of the Poraver pour, at which point it felt routine. 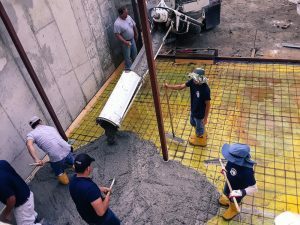 It turned out that the mobile mix truck was a perfect application method because the final water content of the concrete can be finely controlled. The Poraver had an added benefit of making the wet concrete more viscous (due to the round beads of Poraver) so it was not necessary to add water to the mix, as is often done to ease the pour. I believe that the concrete supplier and the masons were very happy working with the Poraver – and we are actively looking into using this formulation on future projects. I am eager for some real world testing of the resultant R-values in the concrete walls with entrained Poraver. 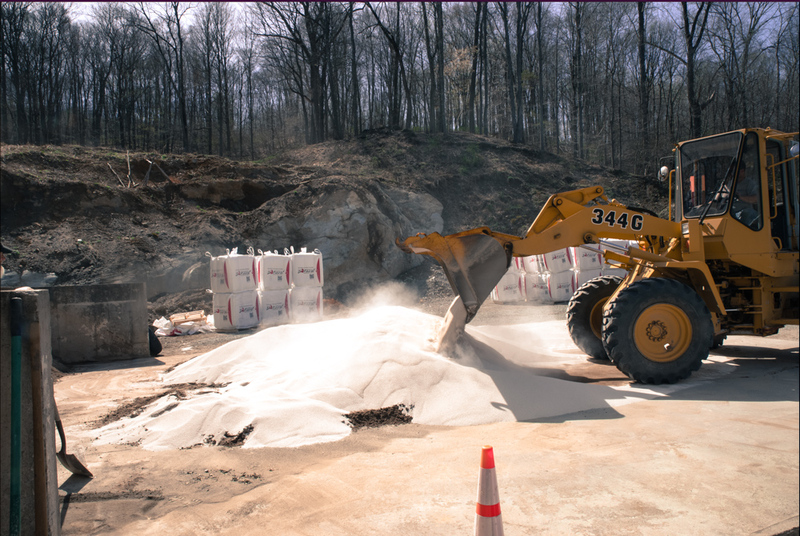 An unexpected benefit of replacing most of the sand in the concrete with Poraver: each load of concrete delivered to the site was about 6 tons (12,000 lbs) lighter than it would have been without the use of Poraver, thus using less fuel to transport and impacting our new road less. After the insulative foundations were installed, the next step was to continue the foundation damp-proofing using Henry CM100 (see above). This damp-proofing wraps up and over the top of the foundation wall to create a capillary break between the foundation and the bottom plate of the framed walls. The capillary break stops the flow of water up the concrete and into the wood wall. To interrupt the upward flow of capillary moisture through a concrete wall, we need to install a barrier (also known as a capillary break) under the wall. Typical barriers include some type of sheet membrane or some type of liquid-applied product. Outboard of the Poraver-entrained concrete walls – which should have an overall R-value of 5, we installed two courses of 2″ Rockwool, for a total R-value of 21 for the insulated foundation walls. The next use of Poraver in this project was as subslab insulation. We contemplated using recycled EPS as subslab insulation, but finding recycled Type II EPS was very challenging. We were also increasingly intrigued by the idea of continuing to eliminate foam from the project. In addition, there is anecdotal evidence of ants living in foam. Overall, we have come to see that despite the fact that the Living Building Challenge allows the use of most foams, we as a project team are excited to find non-foam solutions to superinsulation. I was inspired to eliminate foam in all major assemblies of Mullet Hall by the non-foam track at the 2017 NESEA conference (and Dan Levy of Greenspring‘s work at the Woodstock Passive House). Dan Levy of Greenspring used foamglas below his foundation, but foamglas is no longer available. We decided to use 10 inches of subslab Proaver, for a total R value of 20 subslab. Loose Poraver has a compressive strength of 203psi – more than sufficient for use under the slab. However, its loose nature posed a challenge to the building team. The contractor, Ben Fiering of Third Floor, Corp (and Doctor Structure), came up with a sandwich of 6mil poly, welded wire mesh, and 1/4″ masonite which was able to create a stable surface for the slab-on-grade house and garage pours. The final air/vapor/radon barrier under the slab is Stego wrap taped to the perimeter foundation walls. 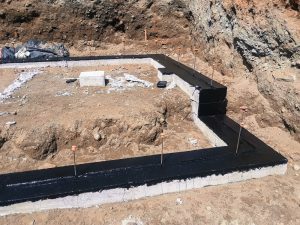 We left a 1/2″ gap between the slab and the perimeter wall which will subsequently be filled with Rockwool to create thermal break between the foundation and slab. We also rested all interior steel columns on a bed of Armatherm in order to thermally break them from the Earth below. 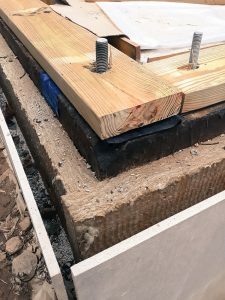 The sill plates have a Conservation Technologies Sill Gasket which completes the capillary break and also forms an air barrier at the sill plate. This joint will subsequently be completely sealed using Henry Air-Bloc LF Liquid Flashing (also Red List free) and then taped with Pro Clima Tescon Vana from 475. 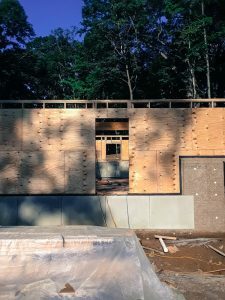 While we didn’t do it exactly as they did it, we found great inspiration from the Framing – Airsealing #2 post at Kimchi and Kraut. When I first read the Kimchi and Kraut blogpost linked above, I wondered why they had so many layers of air sealing at the sill. Now, being in the middle of the process I see that there is a combination of factors (material availability, first-time applicator learning mistakes, desire to create assurances through redundancy, and a real impossibility of fully comprehending the 3D implications of air sealing at material transitions and seams) that contribute to this redundancy. 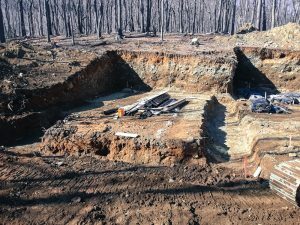 A good number of air sealing details which I had agonized over as we prepared for construction became evidently inadequate as we encountered even rudimentary field conditions such as uneven substrates, uneven wood cuts, and sequencing errors or misunderstandings. One of our main goals on this project is to do our best to develop systems in creating a net-zero energy building which are repeatable and as much as possible in line with construction techniques and trade divisions used by local tradespeople. We have an amazing framing crew led by JVT Carpentry who have put the house frame up so fast that I have had to race to modify air sealing details during construction. The Living Building Challenge material petal requires the use of FSC lumber. We had difficulty finding any local suppliers of FSC framing lumber (we did find a local supplier of FSC plywood). We went back and forth and almost decided to frame the house using Hemlock from Meltz – but decided that using green Hemlock could pose problems in creating a tight uniform envelope (from an air-tightness perspective). Ultimately, we ordered the bulk of the framing lumber from 84 Lumber, who was able to provide full chain-of-custody FSC certification for the framing lumber. We ended up ordering the FSC plywood from Lenoble Lumber. When the plywood arrived on site, I was surprised to see that it was from Brazil. At that point there was no turning back, but I certainly have some reservations about having Brazilian plywood on the house, but am at the same time happy to have participated in the FSC program, despite its faults and complications. The FSC plywood from Brazil is emblematic of the myriad of complicated tradeoffs that one must make in a project such as this – where ecological consciousness is a goal. It is also a reminder that as intimately one can know ones material sources and suppliers – the more confident one can be in ones choices.